When searching for the perfect destination for your honeymoon, the most important thing to do is to think outside of the box! Though many of the European cities are stunning, and Mexico has a certain appeal due to its bright culture and beautiful scenery, why not venture a little further afield? What about somewhere like South Africa? 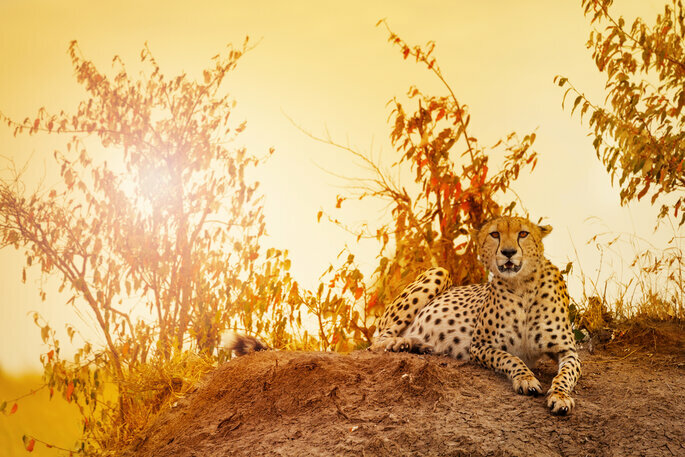 Known worldwide nowadays for its prowess with rugby, incredible wildlife reserves, and steadily progressive attitude, South Africa could be the perfect place for a romantic and adventurous honeymoon for you and your new spouse. There is plenty of explore – and plenty of places to relax – and nowhere further removed from the day-to-day life of a westernized country like the States. So for a whole new cultural experience in one of the most beautiful coutnries on the planet, consider South Africa – and read on to learn more! South Africa is a fascinating country that goes against many national and international norms. Boasting 3 capital cities instead of the usual one, and with an astounding 11 official languages (one of which is English, so don’t panic about not being able to communicate! ), it is a huge nation with a population of around 58 million people. 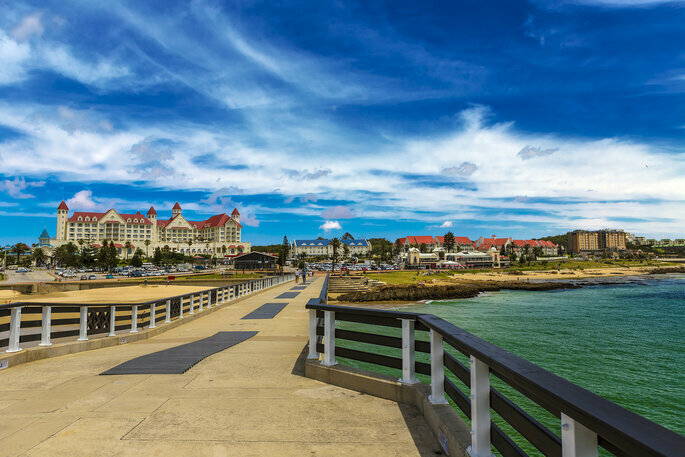 And from the isolated coastlines to the bustling inner cities, South Africa has a soul that is incomparable to any other country in the world – it has a heart that you will surely discover as you take the adventure of a lifetime here! Following the end of Apartheid, South Africa has become not merely one of the more progressive countries on the African continent, but in the world. It was the 5th country to legalize gay marriage in 2006, and its metropolitan centers are acknowledged for their immense diversity and tolerance. That being said, around 80% of its inhabitants follow the Christian faith, and there is a huge complexity with regard to demographics – beliefs and traditions vary between cities and rural villages: explore, but be cautious too! 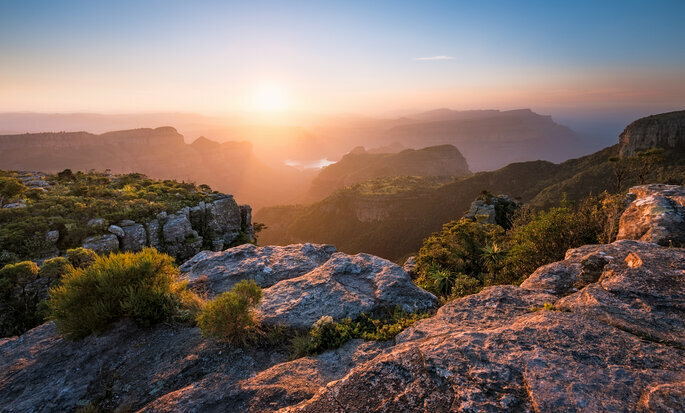 South Africa is an incredibly diverse country – not just in terms of culture, but in topography and geography – meaning that regardless of whether you want a beach holiday, or an adventure-filled fortnight, here is the place that will work best for you. However, in recent years, South Africa has been gaining a reputation for becoming the best place on earth for adventure sports (we’re talking white-water rafting, cliff-jumping, bungee-jumping and skydives – amongst others!). 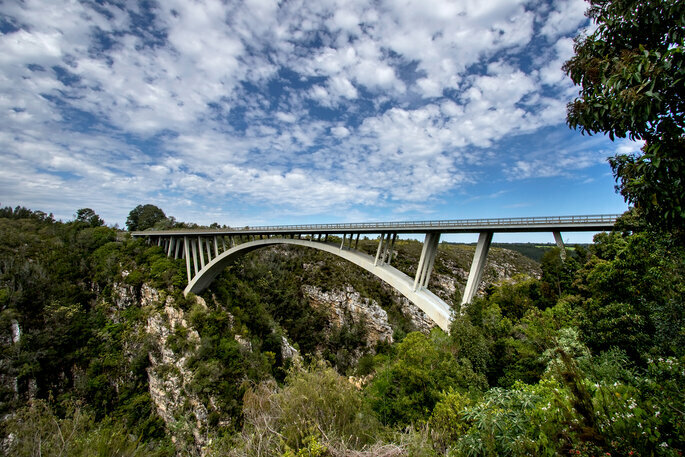 Pictured below is the Bloukrans Bridge – the highest bungee jumping point in the world. 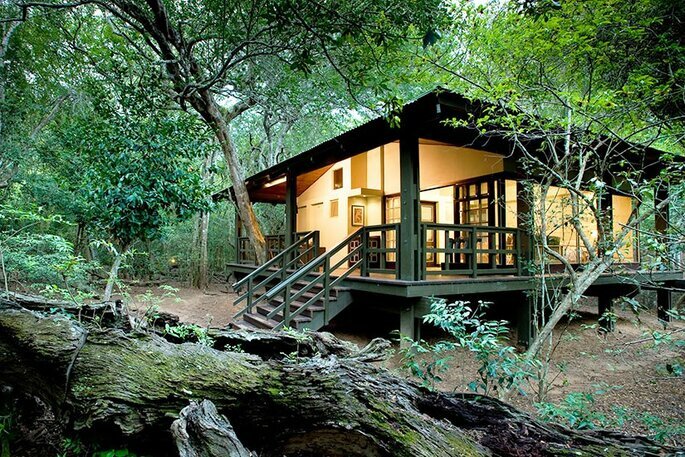 So if you’re after a breath-taking honeymoon, South Africa could be perfect! However, if the idea of jumping off a bridge on your honeymoon isn’t what you had in mind (fair enough), then there are a thousand other things to do in South Africa. One is to simply relax on one of their thousands of miles of beaches – though bear in mind that the hottest, driest months are between November and February, whilst the winter months of April through October are perfect for a whale-watching tour! One of the most highly recommended is Robben Island beach – where you can also take a tour of Nelson Mandela’s prison cell (romantic! 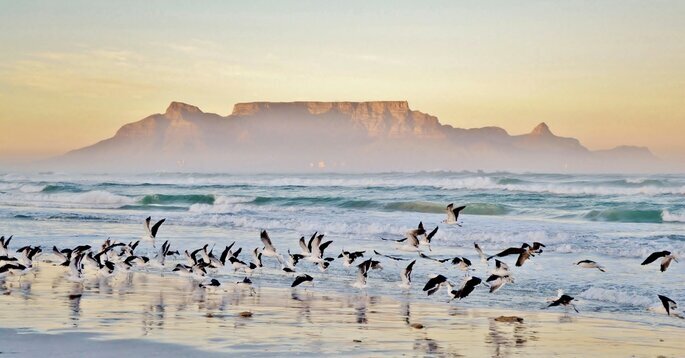 ), have great views of Table Mountain, and see penguins and dolphins! 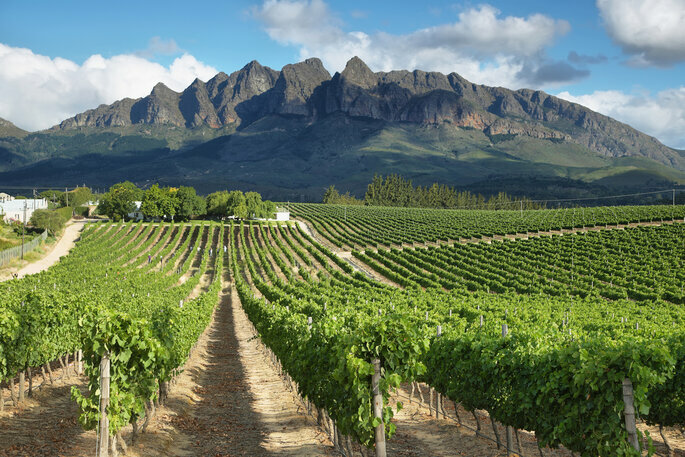 South Africa is famous around the world for its vineyards, which produce some of the most delicious sweet wines you can find. So whilst you should definitely broaden your palette whilst out for dinner, you can take it one step further and go on an incredible wine-tasting vineyard tour. This is available all across the country, and is a fantastic way to explore the more remote parts of this dazzling nation. And of course, what could be a better combination that a honeymoon and lots of wine! And of course, one of the best things to do in South Africa is to explore the rich and versatile markets that you will find in every town and city. Not only for the incredible food – more on this later! 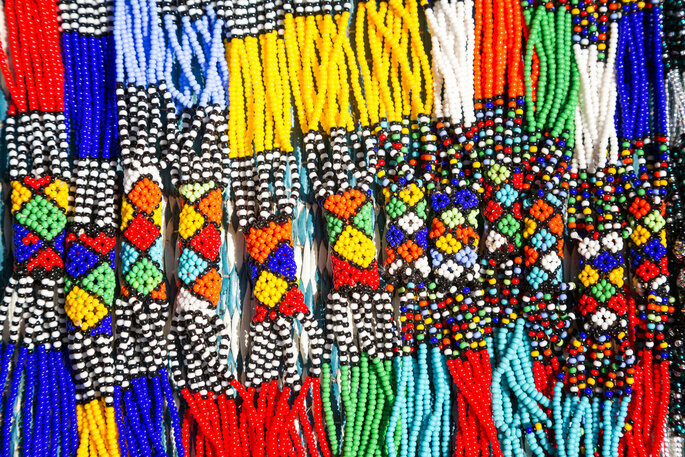 – but for the stunning jewelry and traditional South African artefacts. Get a real sense of their true culture – one that is not marketed towards tourists, but to their fellow countrymen – and explore this colorful country. South Africa, as aforementioned, is huge. You won’t be able to explore all of it in two weeks, but there are several spots that are definitely worth venturing to regardless. 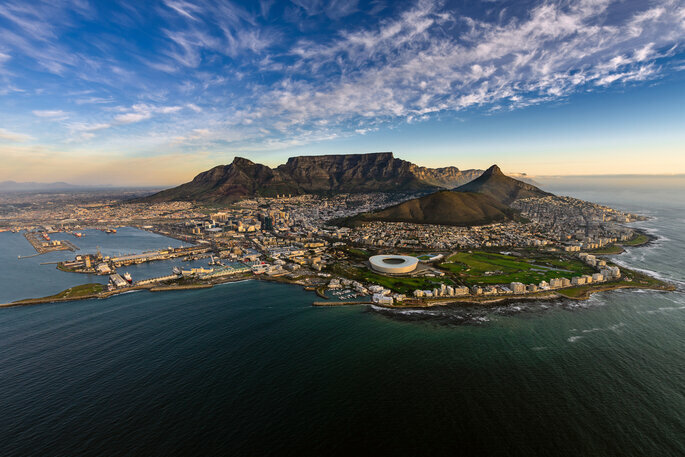 First off is one of the country’s three capitals – Cape Town. 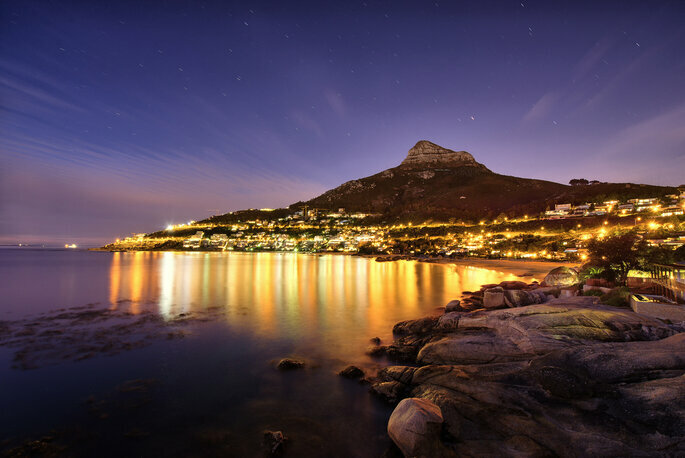 Famous for the incredible Table Mountain – which you can get a cable car to, and enjoy an awe-inspiring panaoramic view from the top of – and its Nature Reserve, Cape Town is the ultimate place to relax. You can also take boat tours around the coastline, and go swimming with dolphins! 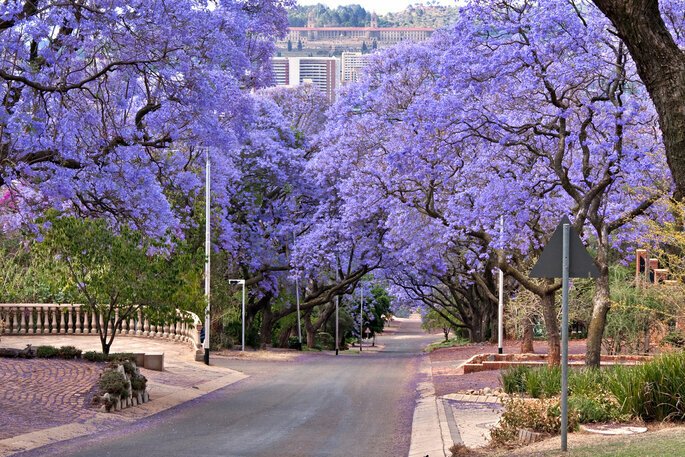 A 2 hour internal flight away is the city of Pretoria, another safe haven for the laid-back honeymooners looking for a stunning backdrop for their romantic trip away. 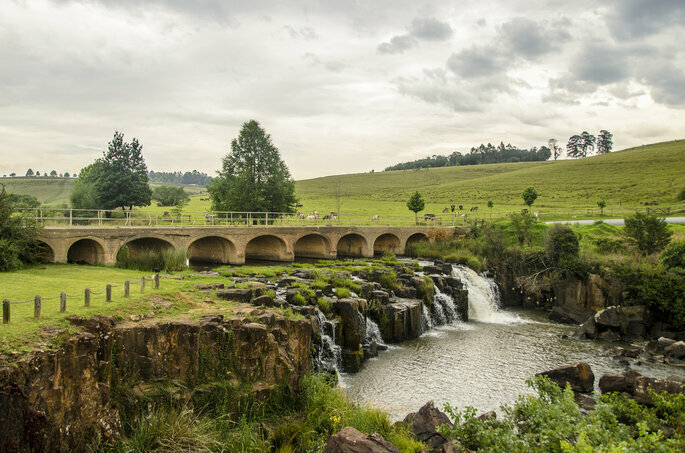 This part of South Africa enjoys a slower pace of life, and so whilst Pretoria is densely-populated, you will barely notice as you stroll through one of their many parks, and enjoy exploring the Italian-themed Duncan Yard. And in the evenings, swap the boulevard for a moonlit horseback ride at Voortrekker Monument! 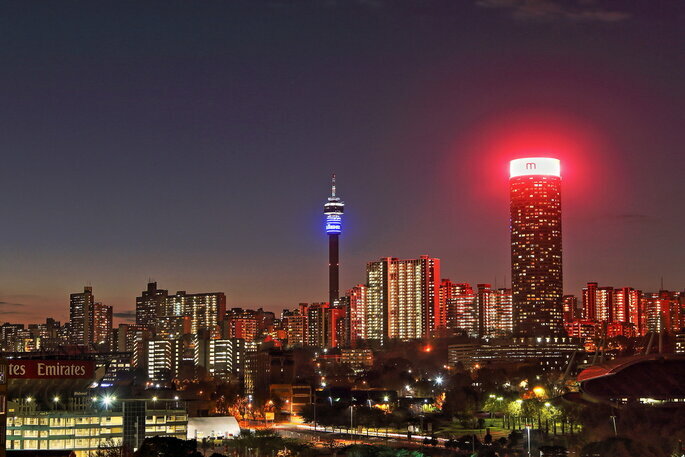 If you’re a younger couple looking for the excitement and vibrancy of a modern city on your honeymoon, then Johannesburg – right next to Pretoria – is definitely worth visiting. Full of the most fantastic restaurants and shopping districts, Johannesburg feels more akin to New York at times, but still boasts a few natural wonders. One thing you truly cannot miss seeing is the Cradle of Humankind – an astonishing complex of limestone caves. However, the big cities are not always the best way to explore the heart of South Africa. So if you’re looking for true culture, and a chance to see unique scenery and landscapes, then we would recommend a journey to KwaZulu Natal. Though a coastal town that is popular with surfing tourists, it is also full of mountains and regions of wild savanna untouched by urbanization. You will be able to see the indigenous Zulu culture before your very eyes, whilst also being able to kick back on the beach. But of course, what would an article about South Africa be without a discussion of the safaris available? 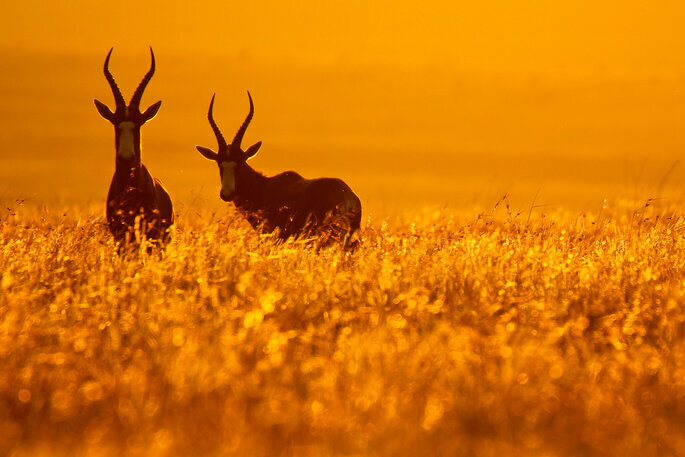 One of the greatest appeals of the African continent as a whole is the incredible wildlife located there. 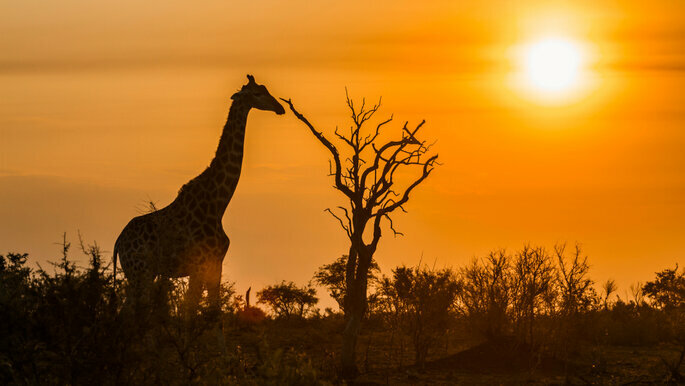 The beginning of all life on earth, this is where much of it has stayed – and we would recommend more than anything else that you take a safari and discover the South African savanna. Though costs vary, $1000 will provide you with a tour and luxurious accommodation nearby too. South Africa is home to the following animals – and is one of few places you can see them in the wild, instead of in a zoo: springboks (the country’s national animal, and the name of their rugby team! ), Cape buffalos, elephants, giraffes, cheetahs, leopards, lions, rhinos, ostriches, African goshawks, black mambas and puff adders. To name but a few! There are 19 National Parks in South Africa, many of which will be home to some of the aforementioned animals. So take advantage of the beauty of the country you are in, and see these creatures for yourselves. South Africa is absolute heaven for foodies. A far cry from the well-known dishes of Paris and Lisbon, South Africa offers something far more distinct – and will provide new sensations for your flavour palette. Below is an image of bunny chow (don’t panic, it’s not rabbit!) 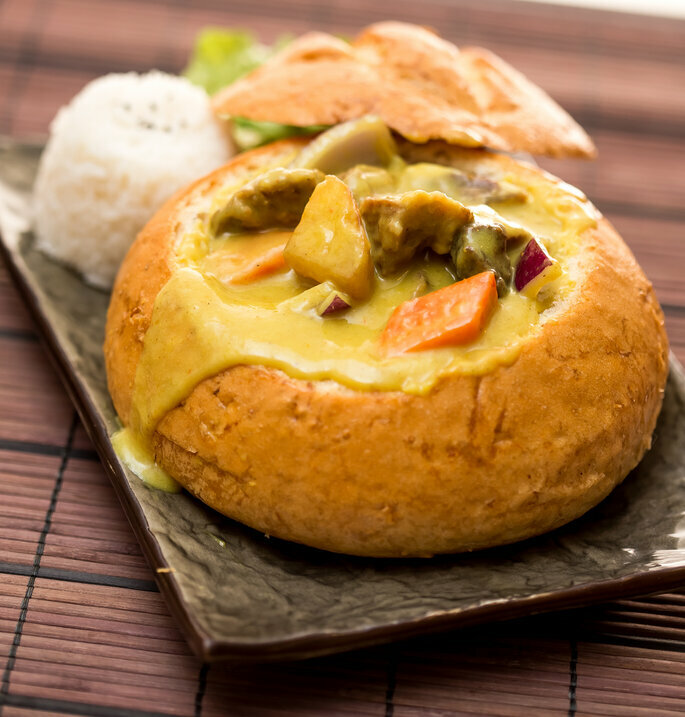 – a traditional South African curry packed with lamb and vegetables and then served in a hollowed-out crusty bread roll. Spices are an African trademark, so you can be sure it will pack a punch! There are also a lot of vegetarian options available in South Africa, despite the large concentration of wildlife in the area. 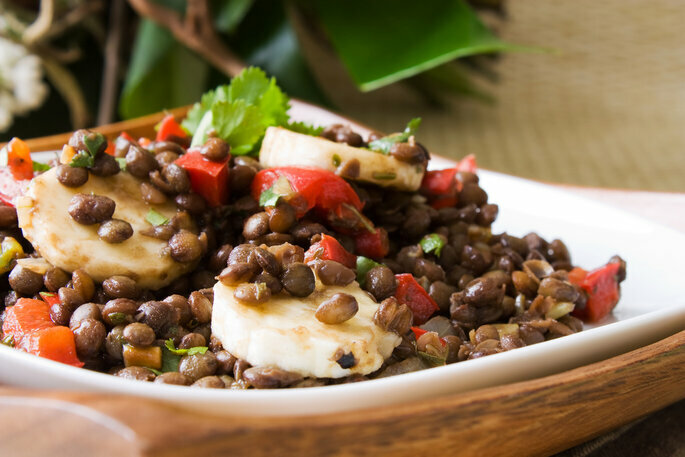 You could try a banana-lentil salad as below, combined with ripe tomatoes, peppers and basil – here is an opportunity to explore flavor combinations you’ve never even dreamed of, and get to love them too! Other traditional dishes include: boerewors (a traditional sausage), chakalaka (onions, tomatoes, peppers, carrots, beans and spices), shisha nyama (barbecue-grilled meats), and bobotie (South Africa’s national dish!). And the fun doesn’t end there! 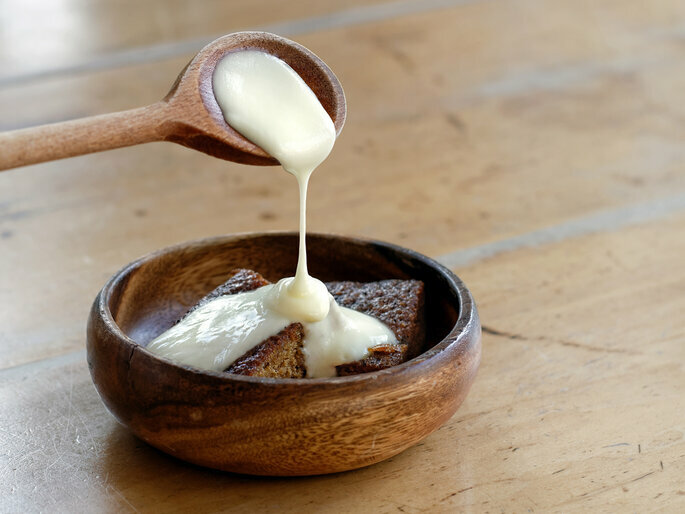 South Africa also has a delicious variety of desserts and sweets available – most famously Malva pudding, which is, in basic terms, sticky toffee pudding with an apricot layer and served with hot cream. This is served everywhere on Sundays, so don’t miss it! When staying in South Africa, it is better to go with a reputable hotel chain that you trust. Whilst it is now one of the safest countries on the continent, there are still some security risks which we would be remiss to not mention to you – so travel in style with one of our favorites! The Phinda Private Game Reserve in KwaZulu Natal is the perfect place for a countryside getaway from the bustle of the big cities. Stay in one of their various eco-lodges in absolute luxury – and with an unparalleled level of privacy and intimacy that you could not find elsewhere. The perfect place for your lowkey romantic honeymoon; plus, easy access to one of the most trustworthy safari-tour providers in the country! The likelihood of any of us being allowed to stay at the real Kensington Palace is unlikely, so why not stay in a namesake property in Cape Town? This modern hotel venue is perfect for an upscale honeymoon – with some of the best on-site chefs in South Africa, and fantastic service available at all hours. 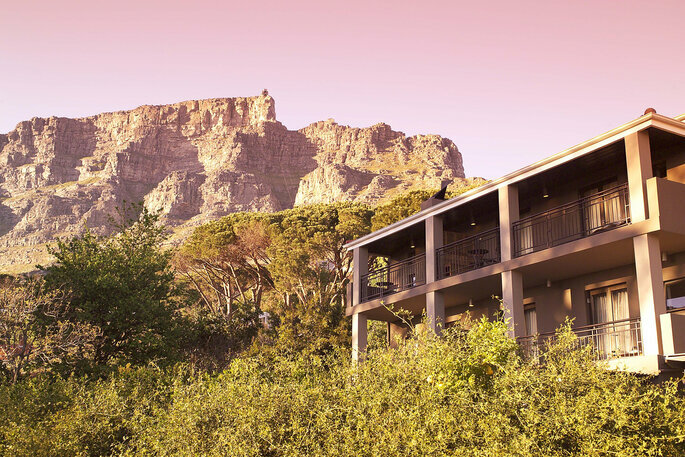 Located in the heart of the Cape Town mountains, the view is picturesque and tranquil – yet mere minutes from the city centre. Your honeymoon in South Africa will require a lot of forethought and planning. This isn’t a country where you can simply rock up and do it as you go along, and not one where you should – there is so much to see and do, and so if you want to take advantage, start organizing yourselves today! This is truly one of the most beautiful countries on the planet, and the birthplace of so much of the life that surrounds us – so immerse yourself in the serene savannas, explore the opulent oceans, and try something totally new. We promise you’ll fall in love all over again. And if you’re not sure yet, try another of our destinations!